Social exclusion is rife in many countries. In Least Developed Countries, just a quarter of workers enjoy secure employment. The rest live on their wits, eking out a meagre subsistence as survival entrepreneurs. They don't know how to develop sustainable business and with nothing in reserve, the smallest setback is disastrous. Millions of young people teeter on the edge of poverty with few life chances. Yet his huge waste of opportunity and potential can easily be addressed by economic empowerment. We don't need to give them money. We don't need big economic interventions. But we do need to equip them with the skills and confidence to lift themselves out of the poverty trap they find themselves in. Our programs support survival entrepreneurs through economic empowerment. We provide basic financial planning, marketing and management skills. This enables them to turn ambition and energy into economic growth. We do not provide finance, but work with NGOs and financial institutions that do. By helping socially excluded entrepreneurs to build better businesses, they invest more wisely. So lenders generate better returns too. Take a look at one of our programmes here. In the UK, reformed offenders are socially excluded in much the same way. Around a quarter secure low wage jobs through charity schemes or a few enlightened employers. For the rest, opportunities are severely limited. So it is hardly surprising that nearly half commit further offences within a year of release. Learning employability skills inside only works if there are jobs, but few employers are willing to forgive earlier misdemeanours, particularly for roles requiring skill or responsibility. So former offenders become survival entrepreneurs too. The parallels with developing countries are striking. For offenders, economic empowerment can be a key factor in rehabilitation. When there are insufficient jobs, the only way out of poverty and social exclusion is to create your own. Part of an effective rehabilitation process requires that people develop a new persona - a new view of themselves. We believe that a rehabilitated persona that identifies social and monetary reward with the application of legitimate and focused effort is far less likely to reoffend. Yet most ex-offenders have no idea how to focus that effort, which is where Grow Inspires can help. We see economic empowerment as an opportunity. As shown, up-skilling borrowers creates better investment returns. But there is so much more. Just as symbiosis creates win-wins in nature, our programmes create win-wins for participants. 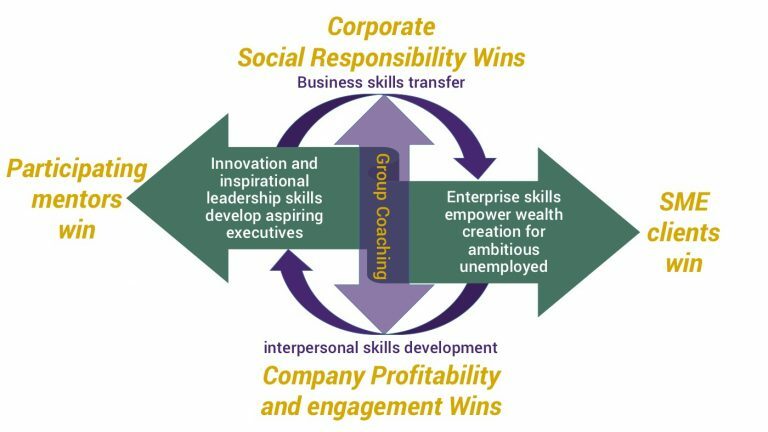 Transferring business skills to others provides amazing skills development opportunities for coaches too. The steady march of technology is putting a premium on people skills. As forward thinking companies seek coaching skills in their leaders, our programmes can develop them. Economic empowerment through sharing corporate skills is not just socially responsible, there is also a compelling business case. Opportunities to develop people and influencing skills in a business context that is also a safe learning environment are rare. The benefits of learning how to influence highly diverse people to achieve far greater business performance are highly relevant. Our business consultants gain people skills through working with their socially excluded clients. Together they collaborate to solve problems in exactly the right context. And finding that growth context is a key enabler to lead innovation projects in their work places and inspire their teams to higher performance. Group coaching enhances the benefits for everyone. Our consultants become better coaches, by learning from each other as well as the experienced programme director. This in turn empowers clients to achieve new heights of performance. Greater CSR wins through higher impact provides a better experience for participants leading to more engagement with the sponsoring company. So it is a win all round. As if there were not already enough benefits, here is one more. Most economic empowerment programmes that tackle developing country poverty or help find work for ex offenders are run by charities. Very few are delivered through a sustainable and scalable business model. We ask our sponsors to contribute less to our programmes than they would spend on classroom based learning. Yet our participants experience so much more that contributes to their development as people. So by delivering better value to corporate sponsors, our programmes become self funding. There is no need to proffer the begging bowl or tug on emotional heart strings. We particularly like this because too many charities paint a picture of misery and despair to raise money. Our experience is the opposite. The energy and resourcefulness of our clients is truly inspirational. And because we deliver our programmes through digital channels, (Skype and email), our participants suffer very little disruption to their working day. So they can literally change the world and themselves in just one hour a week.